Peel, wash and cut the potatoes into uniform small pieces. Put potatoes and garlic in a large pot with cold water to cover. Add a pinch of salt and bring to a boil. Then lower heat and cook until potatoes can be pierced easily with a fork drain, reserving about 1/2 cup of potato/garlic water. While potatoes cook, heat olive oil, minced rosemary and chopped onion in a small skillet over low heat just until onion softens a bit. Transfer potatoes to a large mixing bowl. Pour oil and onion over drained potatoes. Add milk to still-warm skillet - just to take chill off - then pour milk over potatoes. Using a fork, a potato masher or a rubber spatula, mash potatoes with oil and milk. Add 1/4 cup of warm potato water, reserving rest, and continue to mash until mixture is smooth. Taste potatoes and season liberally with salt and freshly ground pepper. 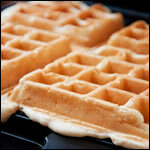 Preheat waffle iron and finish batter by beating eggs into potatoes with a whisk or handheld mixer. Whisk together flour and baking powder and fold into potato mixture with a rubber spatula. 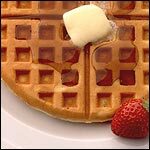 Lightly butter or spray waffle iron grids. (You can skip this step with well-seasoned or non-stick materials.) Scrape batter by half-cup measure onto hot iron, smoothing batter evenly almost to edge of grids. Close iron and bake until brown and crisp. Mr Breakfast's mom is named Rosie and she likes garlic. 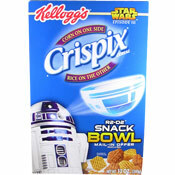 Me thinks Mr B knows what he's making his mom for this year's birthday breakfast. Mr Breakfast would like to thank baseball27 for this recipe. 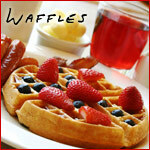 What do you think of Rosemary-Garlic Potato Waffles? Try creamy broccoli and cheddar for the topping :) Really, really good! What would you suggest we use as a topping? I like the idea of using these for chicken and waffles, but maple syrup seems like it would be to sweet. Ideas? Loved em'! 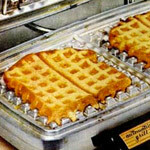 I used buttermilk instead of regular milk and really cranked up the heat on my waffle maker to give them hash-brown-like crust. Thanks "ROBBINL". I've change the category of this recipe thanks to your note. 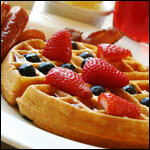 Shouldn't this be filed under Waffles rather than Pancakes? Check out our favorite vintage recipes from old magazine ads and recipe cards. Click here.